A liturgical minister may perform only one liturgical ministry at a time, at Mass. For example, if you are performing the function of Lector at Mass, then you may not also perform the function of Extraordinary Minister of the Eucharist at the same Mass. 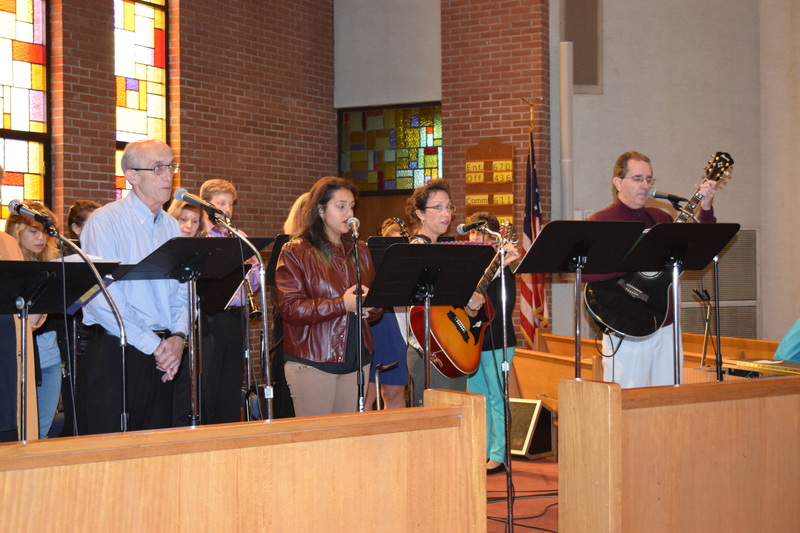 Members of our Adult Choir share their musical gifts with our congregation at the 10:30 a.m. Mass. We always welcome new members to join and share their gift of voice. Rehearsals are held on Wednesday evenings at 7:00 p.m. except during the summer months. All high school students through senior citizens are welcomed to join. If you are interested in serving as a member of our Adult Choir, please contact our Director of Music or attend one of our rehearsals. An Altar Server assists the priest and/or deacon at Mass and at other liturgical celebrations. This is done through specific actions and by setting an example to the congregation by active participation in the liturgy by their actions, singing of hymns, responses of the people, looking alert, sitting or standing at the appropriate times and be respectful and reverent. If you are interested in serving as an altar server, please contact the Parish Office at 410-355-5740. Members of the Art and Environment Ministry help to plan, prepare and arrange our Main Church and Old Church Chapel with flowers and various decorations for the seasons of the Church year. If you are interested in assisting, please contact the Parish Office at 410-355-5740. A Cantor leads the congregation in song during liturgies. Special talents or gifts are needed for this ministry. To minister as a cantor, one should have a singing talent as well as a worshipful presence. Cantors should have a rapport with the congregation. Their demeanor should be welcoming and inviting so as to engage the congregation in participation in the music of the liturgy. Rehearsals are held on Wednesday events at 8:30 p.m. except during the summer months. If you are interested in serving as a cantor, please contact our Director of Music. Cross Bearers are men and women of any age who lead the liturgical procession by carrying the processional cross. If you are interested in serving as an cross bearer, please contact the Parish Office at 410-355-5740. An Extraordinary Minister of the Eucharist, often called a Eucharistic Minister, is a term used for members of the laity who have been authorized to distribute the Eucharist to members of the congregation during Mass. After additional training, Eucharistic Ministers can also distribute Holy Communion to those in prison, or to those who are sick and unable to attend Mass. Family Ministry offers monthly catechetical, social and spiritual activities for families whose children are 4 years old through grade 5. Participation in Family Ministry activities enhances how families develop in their faith lives. For more information please contact Mary Beth Barnes at 410-355-5740 or Teresa Stevens at 410-789-8245. A Greeter welcomes parishioners and visitors as they enter our worship space. Their welcome sets the tone for each person’s experience of the liturgy. If you are interested in serving as a greeter, please contact the Parish Office at 410-355-5740. A Lector strives to make the Liturgy of the Word as meaningful as possible for the congregation, by proclaiming the Word of God. Lectors strive to impart God’s Word in a clear and compelling manner so that the congregation will be inspired to pray and meditate on God’s Word in their daily lives. A clear strong voice and the ability to communicate are required. Parishioners bring the Eucharist to those who are homebound, those who are in hospitals and those who are in nursing home or assisted living facilities. If you would like to be a Pastoral Visitor, please contact Deacon Michael Dodge at 410-355-5740. These volunteers work to keep our worship area and environment beautiful. They are responsible for cleaning the sacred linens, vessels and worship space. If you are interested in serving in our Sanctuary Society, please contact the Parish Office at 410-355-5740. An Usher offers a friendly welcoming presence to those coming to worship. They are responsible to provide assistance in emergencies, to help secure seating, to take up the collection, to ask people to assist at the time of the Presentation of the Gifts, to assist at Communion, to distribute the parish bulletin and to participate in the clean-up of the church after the completion of Mass. If you are interested in serving as an usher, please contact the Parish Office at 410-355-5740. Under the direction of the Youth Minister, opportunities for youth to be involved in social and parish activities are offered throughout the year. For more information regarding Youth Ministry, please contact Leo Quinn at 410-355-5740.